Riding or driving a pony can help those with any kind of disabilities to exercise more freely than they can in a wheelchair. It boosts their confidence in all areas of their life. This organisation gives such people the chance to "be taller for once" than the people around them. They can sit up high on the back of a pony, or travel faster than wheelchair speed in a carriage. In the saddle they become more independent and can cross obstacles that usually they have to avoid. As for creating competitions that are only for the disabled, that is fine and good but I for one love being ABLE to compete on equal ground with everyone else. When I'm in my carriage I AM just as good as anyone else. Unless I tip over then I'm @## out of luck. Diane is in a wheelchair, works for a living (40+ hours a week), AND does all the horse stuff including training youngsters etc BY HERSELF without help. UPDATE: Competing in the Grade 1 class, Diane earned America a Silver Medal at the Third World Championships for Disabled Drivers in Germany in September 2002. Carol Porter, Judi Ralls, James Marshall and reserve Heather Clark returned from the 2002 WCDD with a Team Silver Medal for Great Britain. James and Heather competed shortly afterwards at a Cumbrian driving event. In 2004 Brenda Hodgson, of Seaton, Workington, carried off the Individual Gold medal in the Pairs competition. 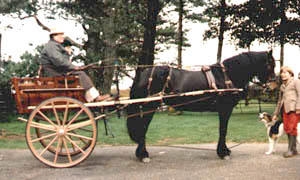 Fell ponies are widely used by local centres helping both adults and children with disabilities. Their determination to take care of themselves translates itself into a wonderful ability to take care of others. Swindale Rose, foaled 1980, was rescued from a "meat wagon" by Sarge Noble when she was three. She went to Brough to be broken in, and spent five years with Sue Millard and her family (left). After a career with them in leisure driving, a little ridden showing, some driven eventing and private driving, she was bought by Brenda Hodgson (see above) and Hazel Hindmarch. With Brenda, she qualified as a Riding and Driving for the Disabled pony, and was driven to a specially adapted carriage for a couple of seasons in cross country eventing. After that she bred several foals for Hazel, and then went to SW Scotland where up to 2004 she took care of disabled riders and drivers. She was an extraordinarily bold and unflappable pony, who took most things in her stride, including people on crutches, people in wheelchairs, and the wheelchair ramp falling off her carriage. Her attitude was one of "Come on, you silly human, sort it out! Do I have to do everything for you?" 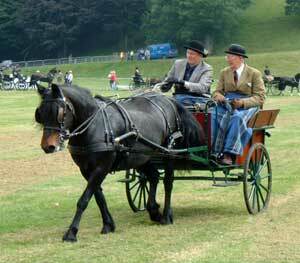 Here she is at Lowther Show, with a wheelchair bound driver and an able bodied whip as passenger/groom. She paraded there in 2002, 03 and 04 and was still ready to flirt with any good looking male Fell who came within range!